Welcome to the Rogers Lab website. 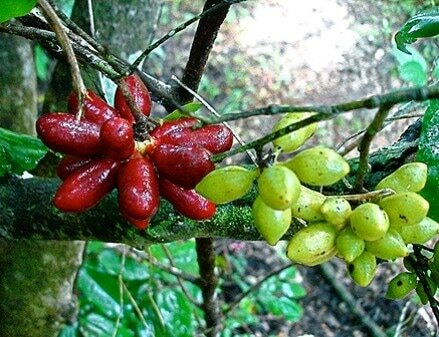 Our research focuses on population and community ecology, plant-animal interactions, tropical biology, ​ecosystem services, and conservation. April 2019: Jerilyn Calaor had her first publication as a co-author in Phytotaxa! It concerns extreme morphological diversity in fourteen new species of conopeate on Guam! April 2019: Congrats to undergrad Ethan Rose for receiving the James and Patricia Dinsmore Scholarship and for being accepted to a summer REU in Colorado! March 2019: Congratulations to Nick Lyon for passing his Masters defense! February 2019: Nick Lyon published his manuscript in Frontiers in Ecology and Evolution evaluating the utility of species distribution models in informing climate change! January 2019: New EBL paper in Royal Society B concerning animal movement and its effects on seed dispersal! January 2019: Congratulations to Jerilyn Calaor, Brittany Cavazos, and Jillian Kurovski for each receiving Finch Grants. Also to Juan Carlos Mungaray for receiving an LAS Undergraduate Research Grant and Ethan Rose for receiving an Undergraduate Research Assistantship. December 2018: Rogers Lab research was discussed in Audubon magazines article titled, "Island of Silence." November 2018: Ann Marie Gawel, Hugo Thierry, Evan Fricke, and Haldre Rogers presented at the MTCC 2018 conference in Guam. November 2018: Congratulations to Brittany Cavazos for passing her preliminary exams for her PhD! October 2018: The Rogers Lab had a successful and exciting lab retreat in Cherokee, Iowa! Glad everyone could make it! ​September 2018: Rogers Lab research was featured in an article with ISU's Biospheres! September 2018: Congratulations to undergraduate Sungju Nielsen for receiving an Undergraduate Research Assistantship. August 2018: The Rogers Lab welcomes new PhD student, Jerilyn Jean Calaor! August 2018: Postdoc, Evan Fricke, moves onto being a postdoc with SESYNC at University of Maryland. August 2018: The Rogers Lab presented at the Ecological Society of America conference in New Orleans! Great job to the presenters: Haldre Rogers, Evan Fricke, Hugo Thierry, McKayla Spencer, Brittany Cavazos, and Nick Lyon! May 2018: Brittany Cavazos published her undergraduate thesis work in New Phytologist concerning vertical transmission and drought stress in annual grass populations. May 2018: Congratulations to Ann Marie Gawel for passing her preliminary exams for her PhD! April 2018: Ann Marie Gawel published her masters thesis research in Royal Society Open Science! An article was written on the manuscript in Anthropocene Magazine and on the The Wildlife Society's website. April 2018: Alex Karnish presented his research at the Iowa State Capitol where he had the opportunity to share his findings with state representatives. March 2018: Ann Marie Gawel was selected as one of the Katherine S. McCarter Graduate Student Policy Award recipients. December 2017: Two new lab members have arrived. Hugo Thierry is a new Postdoc and McKayla Spencer the new Lab Manager! December 2017: New EBL paper in Ecological Applications concerning seed dispersal as both a cultural and supporting ecosystem service. November 2017: 1st Annual Marianas Terrestrial Conservation Conference and Workshop (planned by multiple organizations including the Rogers Lab) on Guam went very well. October 2017: One job opening for a vertebrate ecology postdoc to work with the Mariana fruit bat. September 2017: Two job openings in the Rogers lab - Quantitative ecology postdoc, and Lab manager. August 2017: New EBL paper in Proceedings of the National Academy of Science from former postdoc, Lizzie Wandrag on how dispersal affects species richness and turnover. July 2017: New EBL paper in Global Change Biology from postdoc, Evan Fricke, on compensation in seed dispersal networks. May 2017: Brittany Cavazos rakes in another award. This time the Botanical Society of America Graduate Research Award. Nice work, Brittany! May 2017: New EBL paper on mutualisms and coextinctions with data from the Marianas. Big congrats to EBL postdoc and lead author Evan Fricke! 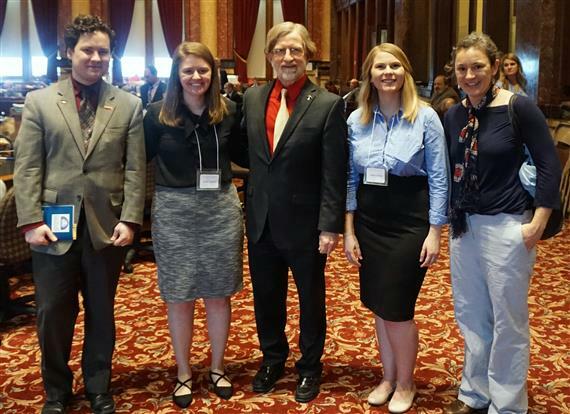 March 2017: Andrea Colton presented her research at the Iowa state capitol where she had the opportunity to share her findings with state senators Quirmbach and Kinney, among others. February 2017: Big month in the Rogers Lab. 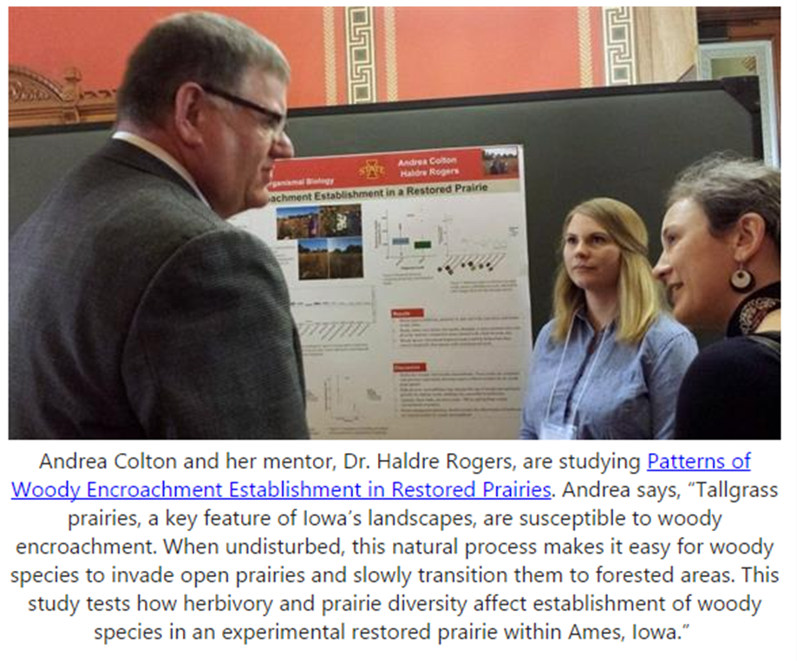 Undergrad Andrea Colton will be one of 20 undergraduate students selected from Iowa State to present her research, "Patterns of Woody Encroachment Establishment in a Restored Prairie", at Research in the Capitol in Des Moines. February 2017: Monika Egerer (REU on the Ecology of Bird Loss project in 2012) and current collaborator received the Kathleen S. Anderson Award for Promising Biologists for her work on the socio-ecological importance of frugivorous birds on the Marianas. February 2017: Check out Haldre on the In Defense of Plants podcast discussing how forests are changing on Guam! January 2017: Ann Marie Gawel was invited to the SESYNC Graduate Workshop on Socio-Environmental Synthesis in Annapolis, MD. December 2016: Brittany Cavazos was invited to the SESYNC workshop on “Phylogenetic and Functional Trait Analyses for Ecology in R” in Annapolis, MD. August 2016: The first two Rogers Lab graduate students have arrived. Welcome to Ann Marie Gawel and Brittany Cavazos! June 2016: We have a full set of field houses in the Marianas! Former Postdoc Lizzie Wandrag and collaborators Amy Dunham and Richard Duncan came to help with resurveys of our experimental gaps for a couple of weeks. We also had 4 post-grad interns, a high school intern through the Step-Up program, five undergraduate technicians, and three biologists, along with a few other volunteers this summer. May 2016: Haldre, along with Clare Aslan from Northern Arizona University and Noelle Beckman from SESYNC, just organized an NSF-funded workshop on seed dispersal in Annapolis, MD. 35 participants. 1 week. Countless ideas. Tons of fun. April 2016: We have two new grad students joining the lab in the fall. Welcome to Ann Marie Gawel and Brittany Cavazos! November 2015: Haldre presents at the Annual Brown Treesnake Meeting in Guam. September 2015: Check out the coverage on Haldre's Bacardi Award in Biotropica. September 2015: Lizzie's paper on seed banks is accepted for publication! August 2015: Haldre moves to Iowa State University. July 31, 2015: End of the summer research presentations @ UoG by the REU's and RET's! July 2015: Haldre wins the Bacardi Award for Early Career Researchers at the Association for Tropical Biology & Conservation annual meeting. June 2015: NSF REU's Marlyn Naputi and Macy Ricketts start. June 2015: NSF RET's Daniel Pangelinan (Okkodo High School, Dededo, Guam) and Roque Indalecio (Hopwood Jr. High School, Saipan) start. June 2015: PostDoc Lizzie Wandrag moves on to a postdoc at the University of Canberra.